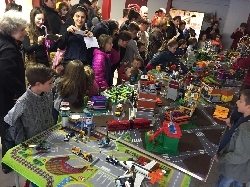 WARRENTON, Mo., Nov. 8, 2018 /Christian Newswire/ -- The international ministry Child Evangelism Fellowship (CEF) is using models built of LEGO® bricks as a tool to build community relationships with families while teaching children the Word of God. The CEF workers partner with local church volunteers by providing the popular building blocks, figures and instructions so the children can create a variety of buildings and vehicles, and by teaching the Bible program. The local church provides the helpers to sit and build with the children. Local CEF worker Mette Sloth of Denmark has held 2-4 day events which draw a large number of families with children ages 5-12. As the children build their cityscape , they also receive foundational knowledge of God who created them and provides forgiveness of sin through His plan of salvation. Most of these events culminate with a family service in the local church. For the past two years Dorthe Jensen, a CEF leader in Copenhagen, has conducted a monthly club "in an area with many troubled children" bringing toy construction bricks for the children to build whatever they want. According to Dorthe, the monthly club format is "very easy to organize and it gives us plenty of time to hang out with the children and get to know them and their parents very well. We see many parents from troubled families enjoying this way of being able to hang out with their children with someone else organizing it for them." Club attendance ranges from 10 to 60 children. A traveling club has spread to Eastern Europe where two CEF workers come alongside local churches to provide a three-hour evangelistic program including a Bible message, a memory verse, and a car full of toy construction bricks. The children love to build with these popular blocks while learning about God, and the churches are enthusiastic about this outreach program. LEGO®is a trademark of the LEGO Group of companies which does not sponsor, authorize or endorse either this article or these events. Child Evangelism Fellowship is an international, nonprofit, Christian ministry that has been teaching the Bible to children since 1937. CEF has 400 offices in the USA and is organized in most nations of the world, with over 3,500 paid staff and hundreds of thousands of volunteers. In its last ministry year, CEF ministered to nearly 22 million children in its face-to-face teaching ministries.